The ProtoTRAK SLX CNC combines the simplicity and flexibility of manual turning with the essential capability of CNCs for efficiency in small lot, toolroom work. 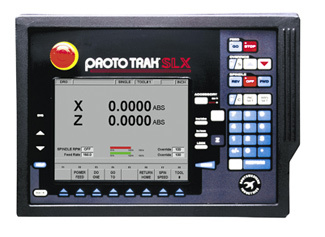 Even in its simplest and least expensive form, the ProtoTRAK SLX is a powerful CNC for toolroom work. Advanced technology blends with the easy, natural user interface that makes the ProtoTRAK the world’s most popular CNC for small lot milling. If more advanced capability is important to you, the Advanced Features have productive routines such as Constant Surface Speed and Spreadsheet Editing. These advanced features are presented in the same, easy-to-use format as with the basic system. TRAKing extends the power of the CNC into the electronic handwheels, giving you complete control over your program feedrate. Crank one handwheel, and both axes move through the program at the speed you determine.